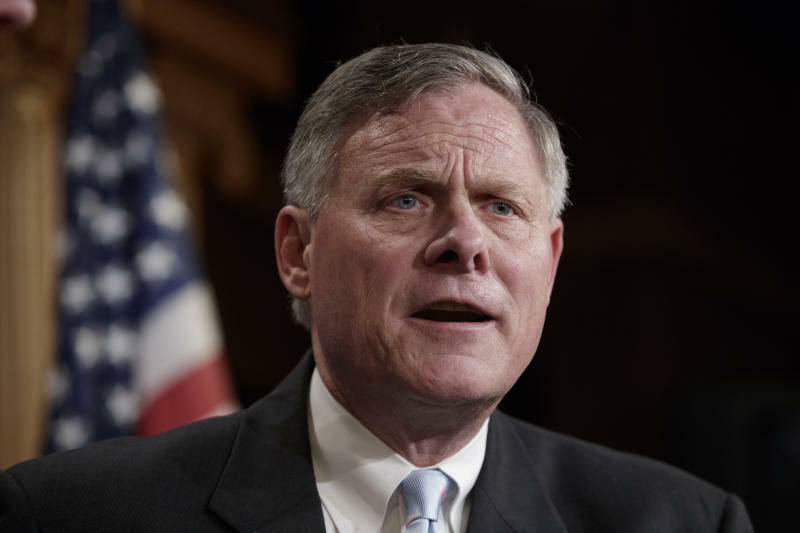 WASHINGTON (AP) -- For much of the last two years, Senate Intelligence Committee Chairman Richard Burr has been the Russia investigator who is seen but rarely heard on Capitol Hill. In an exclusive interview with The Associated Press, the North Carolina Republican opened up about the investigation that has now consumed 19 months of his life. He says it has been "frustrating as hell" and much more difficult than he originally envisioned. But he says the integrity of the investigation — and its importance to the institution of the Senate — is something he has labored to protect. "Nothing in this town stays classified or secret forever," Burr said. "And at some point somebody's going to go back and do a review. And I'd love not to be the one that chaired the committee when somebody says, 'well, boy, you missed this.' So we've tried to be pretty thorough in how we've done it." Burr said there is "no factual evidence today that we've received" on collusion or conspiracy between Russia and President Donald Trump's campaign. But he said he's still open on the issue and hasn't personally come to any final conclusions, since the investigation isn't finished. The Senate investigation is the last bipartisan congressional probe of Russia's interference in the 2016 election and connections to Trump's campaign. Working with the panel's top Democrat, Virginia Sen. Mark Warner, Burr has so far managed to keep the investigation free from the extraordinary acrimony that has plagued work on the House side of the Capitol. The House Intelligence Committee bitterly fought through its entire Russia investigation, which ended earlier this year despite the objections of Democrats. "From an institution standpoint I want the American people to understand that the Senate can function, even on the most serious things," Burr said. Normally a self-described creature of habit, Burr says his schedule has been upended. He says he has had "no life" since January 2017, when Senate Majority Leader Mitch McConnell asked him to start the investigation, and as the panel has chased leads — and leads that came from those leads — in the United States and abroad. He says the international aspect of the probe, the sheer number of players connected to one another and the many lawyers that they have to deal with have made the work more challenging than originally expected. Still, he says he doesn't think the committee should rush to wrap up the work, saying "the worst thing we can do is to prematurely try to end" the probe. He says the panel still has a handful of people to interview behind closed doors and some who they may want to interview again, though he isn't making any commitments on bringing witnesses forward publicly. "If the intent is to have a show trial, I'm not a participant," Burr says on public hearings. He says "I don't see a reason today" to bring back Donald Trump Jr., the president's son, who participated in a meeting with a Russian lawyer at Trump Tower during the election. That meeting has been a focus of the committee probe and special counsel Robert Mueller's investigation. Trump Jr. spoke to committee staff at the end of 2017. The committee is also still talking to lawyers for former British spy Christopher Steele, who compiled a dossier containing allegations of ties between Trump, his associates and Russia during the election, and lawyers for WikiLeaks founder Julian Assange in hopes of gaining closed-door interviews, Burr said. WikiLeaks released hacked emails from Hillary Clinton's campaign in 2016. Burr won't give a timeline for the end of the investigation or a final report, which could create fissures in the panel's so-far bipartisan unity. Many Democrats are likely to disagree that there is no evidence of collusion, if that is the committee's final conclusion. "I am sure there will be people at the end of this who feel that we came to a conclusion that they vehemently disagree with," Burr said. "I know that from a committee's integrity standpoint we've got to prove what we find. And if you can't prove it then we can't make the claim." "I have confidence in Richard Burr that we together, with the members of our committee, are going to get to the bottom of this," Warner said last year. "And if you get nothing else from today, take that statement to the bank." Unlike many of his Intelligence Committee colleagues, Burr has eschewed cable television appearances and refrained from visiting the White House and interacting with Trump. Republican Sen. Jim Lankford of Oklahoma, who sits on the intelligence panel and is close to Burr, says Burr started every meeting at the beginning of the probe by asking senators not to talk to the media "until we get additional facts and we put things out together." Lankford says it's possible the final report will split the committee. "The hardest part is when staff starts going through all of the details and writes the last report," Lankford says. "And then we start having people say, I won't say that. That's the threat." For now, Burr says, the committee is preparing to put out two reports by the end of September: one on the Obama administration's response to Russia's election interference, and a second on Russia's election meddling on social media. The committee is also expected to hold a hearing with Facebook COO Sheryl Sandberg and Twitter CEO Jack Dorsey in the first week of September. "I don't think any of us when we started understood just how coordinated the disinformation and societal chaos campaign was. I think what probably will be shocking is how early it started — much earlier than the parameters that people have put on the 2016 election," Burr says, teasing information that will come out in one of the future reports. He wouldn't give any additional details.